How ironic this summer of 2015 has been! When I wrote my article “Making Hay While the Sun Shines” for the last edition of SFQ, it had been a fairly dry spring. It looked like the summer of 2015 would be short of rain. Not too long after that article was written, it began to rain, rain, and rain, throughout the entire month of June. I have been making hay for 35 years in the Central New York region, and this has been by far the wettest season that I have ever encountered. In June and early July, it was all but impossible to make dry hay in a timely fashion. Even making haylage and baleage (high moisture hay) was challenging. 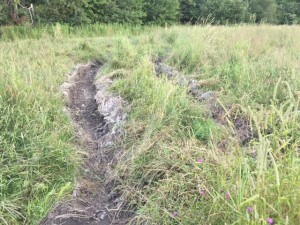 Not only that, but there was so much rain that the soil was saturated with water, so that when a few brief periods of sunshine appeared, you would go out into the fields attempting to mow hay, and sink into the ground causing permanent rutting damage to the fields. 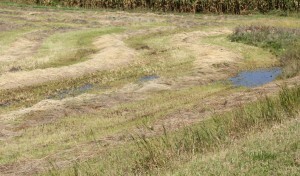 The three photos show some of the typical damage to fields that has been all too common this year. As small, beginning, and seasoned farmers, we stoically march on; but what are some strategies that we can employ to deal with this type of season? We have some field damage, and late, oftentimes rained on hay crops, and with the subsequent lower quality of forages to sell or feed to animals. Knowing that we may be short of forages, maybe this year might be a good time to sell a few animals that we had been planning on keeping, if we can’t buy or make enough decent quality feed. Maybe we can extend our grazing season; it has been a fairly good year for grazing with no shortage of rain. With pastures growing well this year, by extending our grazing further into the fall, we can cut down on the amount of stored forages we need. Try stockpiling some grazing; instead of trying to make second or third cutting hay, hold onto some of those cuttings and instead graze them later in the fall. Look around and try to locate some decent hay for sale. Dairy quality forages will be in short supply, and expensive, but other classes of livestock can get by with somewhat lower nutritional value feeds. Much of the feed this year will be lower in quality than we would like. The old saying is true, “the early bird gets the worm,” so don’t procrastinate and wait until the snow flies before you try to locate some more feed, only to find out that it has all been bought up. If you do buy hay, inspect it zealously to make sure that it hasn’t been spoiled. I have found that even making hay in the required three day window this summer has still resulted in the crops still being a little too moist for long term storage. Hay put up at too high of a moisture can spoil, be bad for animals, it can be a fire hazard, and it can contribute to respiratory diseases in both animals and humans. If you are not feeding animals strictly for a grass fed market, maybe you could locate some alternative grain by product feeds to help extend your forages, such as beet pulp. Become knowledgeable about growing and grazing summer annual forages, of which there are many, and which can give you some alternative sources of feed for your animals. These crops could be grazed or put up as dry hay or high moisture forages, but do require that you have machinery to fit and till the soil. Information abounds from vendors and service providers such as Cornell Cooperative Extension. With all the rutting damage out there, you may need to refit fields or plan for some new seedings next year; nothing is more aggravating than trying to drive machinery over deep ruts, causing damage to your machinery. Inspect your tractors and hay making machinery for damage from having dragged them through wet spots. Washing all of the mud off of your machinery with a high pressure washer would be time well spent. Rich Taber can be reached at 607-334-5841 ext. 21 or email: rbt44@cornell.edu.